The Great Hall is the room on which most care and expense has been lavished; palace architect Linstow called it the only truly grand room in the building. Nowadays the Ballroom is used for luncheons and after banquets, and is the room where the King presents honours to the recipients. 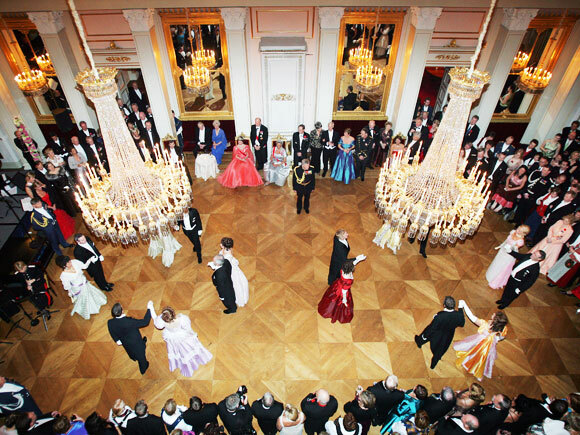 The most recent ball to be held in the Great Hall took place in 2005 and marked the centennial anniversary of the dissolution of the union between Norway and Sweden. The ball for the silver wedding anniversary of the King and Queen was held here in 1993, as was the wedding ball for the Crown Prince and Crown Princess in 2001. The budget for the Ballroom was 12,000 rix-dollars, which was one-third of the total amount spent on the decoration of the entire second floor, including the two wings. Linstows main inspiration was the concert hall in Berlin, designed by the architect Karl Friedrich Schinkel and built in 1819-21, and the Great Hall in Christiansborg Palace, Copenhagen, designed by Christian Frederik Hansen at the beginning of the 1830s in connection with the rebuilding of that palace. The Ballroom is two storeys high, with a ceiling height of 10.7 metres and an area of 360 square metres. The second storey is formed by a gallery that runs round the hall. There are 12 columns of white stucco marble and 24 wooden pillars supporting the gallery. On the short sides another 12 columns of white stucco marble extend from the gallery to the ceiling. The principal colours of the Hall are white and gold, with pink wall panels and gilded mouldings. The coffered ceiling is sky-blue, with diamond-patterned panels. The room contains eight large mirrors, four on each longitudinal wall. Each mirror is made up of four smaller mirrors in order to save costs. Many of the decorations were imported ready made from Berlin. The capitols of the columns and pillars were moulded in zinc by Geiss and the gilded papier-mâché ornaments were made in the workshop of Carl Gropius. The Ballroom was originally lit by four large prism chandeliers, each holding 48 candles. The gallery was lit by 20 candelabra, and eight smaller chandeliers hung beneath the gallery, in front of the mirrors, and there were three chandeliers under and three above the minstrels gallery. The chandeliers were sold at auction in 1903 when electric lighting was installed at the Palace. They were replaced by electric, rosette-shaped lights bearing the monogram of King Oscar II. The four large and the eight smaller wheel-shaped chandeliers in front of the mirrors were reconstructed in the autumn of 2005 and once more lend ambience to the festivities. The furniture includes two high-backed gilded chairs with arm rests and five chairs without, all upholstered in deep red velvet. The chairs were intended for King Oscar I, Queen Josephine and their five children. The style is early Neo-Baroque and thus later than the style of the hall as a whole, which is strongly influenced by Late Classicism. The hall was also furnished with freestanding and built-in benches upholstered in red plush. Both these and the chairs are still in use. The 10 windows were hung with heavy deep red velvet curtains, and todays curtains, which are also in dark red velvet, are trimmed with the original fringes of 1846, decorated with braiding in rich gold silk. They were made by the German-born passementerie-maker Heinrich Sommer, who had settled in Christiania (as Oslo was then called) when the palace was being furnished, in the hope of obtaining commissions. The panels of the coffered ceiling, which had been painted green, was restored to their original sky-blue in 2002. The stucco marble columns was painstakingly restored by a German specialist, Manfred Siller, and was finished in 2003. 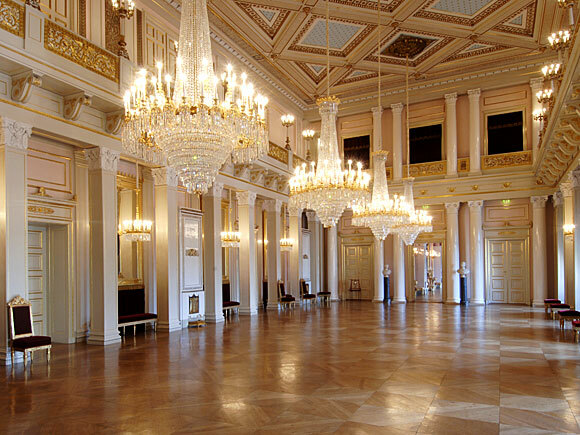 In 2005, the restauration work was crowned with the reconstruction of the Ballroom chandeliers. Store festsal på Det kongelige slott. Foto: Kjartan Hauglid, Det kongelige hoff.